Contact Abishek Estates for Exclusive Offers !!! Call Abishek Estates for Exclusive Offers ! Hurry !!! 200 Rs Per Sq.ft Off !!! Call AbishekEstates for Exclusive Offers ! Hurry !!! Prestige Jindal City in Tumkur Road, Bangalore West by Prestige Group is a residential project. Central 4.5 acre Landscaped Podium level. Project With Attached Metro Station. The size of the Apartment ranges in between 607.0 sq.ft. and 2171.0 sq.ft. Prestige Jindal City price ranges from 29.37 Lacs to 1.05 Cr. Prestige Jindal City offers facilities such as Gymnasium and Lift. It also has amenities like Badminton court, Basketball court, Lawn tennis court and Swimming pool. It also offers services like Banquet hall, Community hall, Grocery shop and Library. This is a RERA registered project with registration number PRM/KA/RERA/1251/309/PR/180406/001495. It is a new launch and under construction project with possession in Oct, 2021 with few units already sold out. The project is spread over a total area of 32.37 acres of land. It has 88% of open space. Prestige Jindal City has a total of 15 towers. The construction is of 30 floors. An accommodation of 3571 units has been provided. Prestige Jindal City brochure is also available for easy reference. Where is Prestige Jindal City located? The project is located in Tumkur Road, Bangalore West. What apartment sizes are available in Prestige Jindal City? The project offers apartments sized between 607.0 sqft and 2171.0 sqft. What is the area of 1 bhk in Prestige Jindal City? 1 BHK units in the project are available in a size of 607.0 sqft. What is total area of 2 bhk in Prestige Jindal City? The area of 2BHK units in the project varies from 962.0 sqft to 1111.0 sqft. What is the 3 bedroom size in Prestige Jindal City? The area of 3BHK units in the project varies from 1373.0 sqft to 1730.0 sqft. What is size of 4 bhk in Prestige Jindal City? 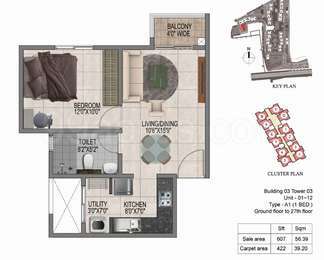 The area of 4 BHK apartments ranges from 2021.0 sqft to 2171.0 sqft. i, Mangalore and Mysore. In 2009, with The Collection at UB City, Prestige gave Bangalore, and India, their most preferred luxury shopping destination housing over 40 of the world's best known luxury brands under one roof. Through Prestige Property Management and Services, the Group provides world class, impeccable property and facility management services to its customers. Under the aegis of Sublime, headed Ms. Uzma Irfan, the Group promotes the cause of fine art and culture, providing a platform for artists and art patrons to meet and interact through Sublime Galleria. Ms. Sana Rezwan heads 23 Carat, a luxury retail consulting firm under the auspices of which she has also established Mason, a luxury boutique that brings global hate couture to India. Spring Green, spearheaded by Saeera Noaman, is the Group's initiative in horticulture and landscaping, which provides all the flora that adorns Prestige properties, besides that of its many other clientele. Prestige is also involved in the field of education through in venture Academy at Bangalore. In-venture is a globalized, progressive school which follows the pioneering principles of multiples intelligence in its pedagogic approach. Bench marking itself against international standards, it has already made a strong mark in various national academic and competitive arenas. Using this strong foundation as a launch pad, the Group continues to spread its wings across a wider geography. The future thus promises to be one of continued aggressive growth. Malls on the lines of The Forum, large townships, tech parks, hotels, luxury Villa, and SEZs will dot the skylines of Chennai, Goa, Hyderabad, Kochi, Mangalore and Mysore, besides Bangalore, in the coming years. The Prestige Group aims to leverage its formidable experience, expertise and technology to give the citizens of each location an unparalleled living and working experience. Brand Prestige is today synonymous with the highest professional standards. Prestige is one of the very few developers to get the Crisis DA1 rating and to become an ISO 9001:2000 certified company. Prestige is the only company in Bangalore whose software and residential structures have won the reputed FIABCI award. For all this success the Prestige Group applauds and acknowledges the tremendous support and faith shown by its customers, business partners, and well-wishers. Prestige is also firmly committed to a cleaner and greener environment and all the Group's developments have specific areas set aside for landscaping. Prestige has also taken an active role in improving Bangalore's civic infrastructure. For instance, together with the UB Group, Prestige helped to upgrade Vittal Mallya road in the heart of the city to world class standards. Prestige was also involved in improving a 10 km stretch of road in Whitefield, a sought after suburb of Bangalore. To top it all, beautification work done by the Group has won many, Best Garden awards at various horticultural shows. After all, the future has to be protected as it doesn't belong to us: we have only borrowed it from our children. Since I am interested in purchasing a resale apartment in Prestige Jindal City, I would like to know the list of key documents which are mandatory at the time of purchase. HI Jiten, as per your concern, here is a list of documents which are necessary to purchase a resale property: 1. Sale Deed- which acts as the proof of sale and transfer of property. 2. Building Plan- a building plan must be checked by the local municipal authority. 3. Completion/Occupancy Certificate- Completion certificate is issued by the municipal authority on completion of the project. Occupancy certificate is also issued by the government authority to a project once it gets completed and is deemed to be fit for living. Both of these are required while applying for water, electricity connection. 4. Encumbrance Certificate- Which ensures that the property doesnt have any dues and legal liabilities left. This can be received form the local authority from where the property is registered. 5. Tax Receipts- One should always check all the latest tax receipt which eliminates the risk of any dues left to be paid. What amenities should I expect to get at the time of completion in Prestige Jindal City? Hi Vicky, at present, the status of Prestige Jindal City is under-construction and as per the information available on the projects official website, amenities such as gym, clubhouse, indoor and outdoor games, ATM, swimming pool, theatre, landscape garden, CCTV cameras, etc. will be available at the time of possession. The only point of concern is that it is going to have just one swimming pool for approximately 3500 residents.